These United States Mint 1/10th oz American Gold Eagle Proof coins have undergone extensive inspection by PCGS experts, before being assigned a perfect PR-70 Deep Cameo grade. Additionally, PCGS seals these coins after grading them, to make sure that no harm comes to them in transit. 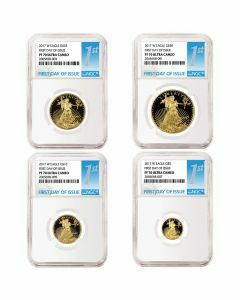 Furthermore, an elegant flag label from PCGS inside the plastic casing highlights their ‘First Strike’ certification, indicating that these coins were struck within the first 30 days of the release of the 2017 American Gold Eagles. Unlike their bullion coin counterparts, these proof coins also have the ‘W’ Mint Mark of the West Point Mint, imprinted on their reverses. PCGS, or the Professional Coin Grading Service, was founded in 1985, with the sole aim of providing reliable standards for precious metals coins. Each of these 2017 American Gold Eagle Proof coins contains 1/10 ounce of 0.9167 pure gold (also called 22-karat gold). Moreover, they also bear a nominal face value of $5, assigned by the United States Government. The beautiful rendition of Lady Liberty, striding forward with a torch in one hand and an olive branch in the other one, graces the obverse of this proof coin. In fact, the Deep Cameo condition of these designs truly stands out, making the image come alive, unlike any other versions of the American Gold Eagle coins. Their smaller size allows greater portability, making them easier to transport and store. Grab these perfect 1/10 oz 2017 American Gold Eagle proof coin specimens to complete your coin collections.